Guilds of Ravnica is officially spoiled, and that means Magic's most popular tournament is about to take place: the prerelease! Tons of players who don't necessarily come out for other tourneys are about to get their Guild on. Most people don't put hours and hours of prep time into these events. But I do! Magic is all about finding fun in figuring out probabilities and playing to your best odds, and that starts long before the tournament. But if you don't want to do hours and hours of Scryfall searches yourself, here are some results of mine. First of all: you'll pick one of five Guilds at this tournament. I'm assuming a passing familiarity with each of the guilds and their mechanics; if you don't have it, I'd encourage checking out Marshall Sutcliffe and Luis Scott-Vargas's podcast. The first strategic choice you get in the prerelease is which guild you pick, since one of your standard six sealed boosters will be replaced with a seeded pack of cards that work in your guild. Guilds sealed is all about figuring out how greedy you should be. This isn't quite as true with the seeded packs, but it's still the fundamental question. Back in Return to Ravnica block, two-color sealed decks were the norm. Not so here. The five Guildgates each take up two common slots, meaning the fixing density at common is going to twice what it was back then. Add in the five Lockets (excellent in sealed), Urban Utopia, and secret Gate Gateway Plaza, and the color fixing at common is actually better than it was in Khans of Tarkir, a sealed format where three colors was default and four or five-color monstrosities were common. I expect UBG, UBR, and even some UBGW or UBGR decks to be very viable. Dimir has an incredibly versatile blue midrange shell, and green's Urban Utopia / District Guide / Circuitous Route core provides mana fixing without putting you down on cards. 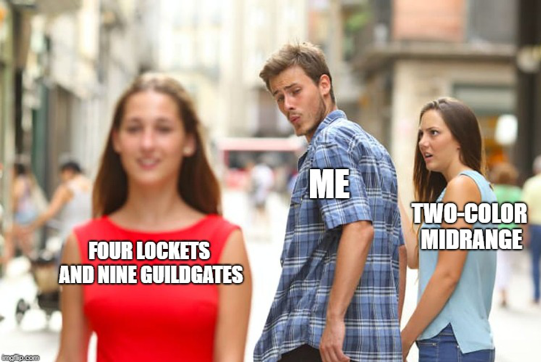 Obviously you shouldn’t go crazy if all you have is three Boros Guildgates and a Golgari Locket. Build from your fixing, not vice versa. ...there are powerful payoffs to playing exactly two colors. At the prerelease, the faction packs all but guarantee that you have enough playables for a solid two-color manabase. But some of the cards themselves also encourage strict two-color play. The MMNN uncommons are completely absurd, but without some fixing they're hard to cast even in two color decks. Conclave Cavalier is especially ridiculous, Crackling Drake has mythic rare upside, and Nightveil Predator is one of the most obnoxious limited cards I've ever seen. This cycle is especially good with Lockets, since the creatures are powerful enough to catch you up after taking a turn off to cast your artifact and cheap enough to let you cast a second spell in the same turn. This lets you use the fixing and the ramp of the Locket to stabilize quickly and then create an advantage when you cash your Locket in for two cards. If you're Boros, anything you can do to enable attacks without trading – removal, combat tricks, Roc Charger (a perfect candidate for mentor bonuses) – is a high priority. You want to be running at least six spells that can get your guys through combat. Unfortunately for Boros, the Auras in this set are terrible. For those of us who like fun, that's probably a good thing. A quick note: the converse of this is true against black decks, especially the kinds that want to play something like Moodmark Painter. You don't want to trade with these decks, so a 0-power dork like Grappling Sundew can be just what the doctor ordered, especially if you're Convoking. Just make sure you're playing Notion Rain or something so you can actually use the time you're buying. ...so that you can sideboard quickly and in volume. In addition to aggressively adjusting your creature base based on the matchup, the fixing density of Guilds allows for adding and cutting whole colors easily. It will often be correct to swap out big cores of your deck – to go, say, from base-Selesnya against fast decks to full-on Boros in matchups where you really don't want to be casting Centaur Peacemaker. As for traditional sideboard cards, artifact removal is largely irrelevant, as there are essentially no equipment or artifact creatures that matter and picking off random Lockets is nothing special. Enchantment removal, however, should be very good, especially at instant speed; there are several common and uncommon removal Auras you can blow up in combat for a blowout, especially in white. Crushing Canopy seems very maindeckable. It won't be unusual at all for green decks in this format to five or more big creatures. There are three quality, high-impact common fatties -- Kraul Foragers, Siege Wurm, and Vigorspore Wurm. Siege Wurm is the best and most aggressive of them, coming out as early as turn four with the help of one-drops or token-makers. Casting Prey Upon after convoking him out is delicious. Foragers is a fantastic stabilizing play if you've engineered a few trades, and Vigorspore can end games no other card in the set can win by giving +9/+9 to a flier or a lifelink Soldier token (or a Healer's Hawk!). This is to say nothing of rares, gold cards (Rosemane Centaur is particularly excellent) Affectionate Indrik (aw!) and Arboretum Elemental (shudder). Golgari and Selesnya Locket will be fueling some hot fire. ...The rares in the Golgari and Selesnya faction packs are dope. The rares with Selesnya watermarks are great across the board. March of the Multitudes is a ridiculous bomb – don't forget it's an instant! – while the worst rare you can open is a $20 bill. Golgari isn't quite as strong, as there are a couple of duds; Charnel Troll needs a ton of support and Mausoleum Secrets is hot garbage. The other Golgari rares, though, are ridiculous bombs. Find//Finality is my early pick for the best card in the set, while Underrealm Lich, Hatchery Spider and Izoni are game-ending value machines. I don't believe you can open Vraska in your faction pack, but she is outstanding as well. Boros might have the best rares of all; again, the shockland is the worst one, and Boros is the best-equipped to take advantage of the ETB-untapped upside. Among the spells, only Deafening Clarion is a bit awkward, since it's so bad when you're curving out. Meanwhile, Tajic and Aurelia are houses. Dimir has Doom Whisperer and Etrata, the Silencer, which are probably the two best creatures in the set, but there are a lot of rares that do absolutely nothing. And it cannot be overstated how bad Izzet's rares are. Your shockland is your best rare, which is the worst available rare in multiple other guilds. If you're a blue mage, you come to this event with a choice. You could pick House Dimir. You could spend a crisp Fall afternoon casting reasonable bodies that give you plenty of value outside of attacking and blocking. You could open strong rares. You could cast Notion Rain on turn three and honorably fight your way back from behind with Deadly Visit and Artful Takedown. You could look your opponent in the face at the end of the match and stare into their dark eyes, glittering strangely in the flourescent game store light, and have a glimmer of mutual understanding, a moment you realize, as you step into the gentle drizzle of the September night, was a precious moment of true respect. OR, you could yeet people out with Wee Dragonauts and Gravitic Punch. Now, Izzet's multicolored uncommons are very strong, and if you open a lot of them you can create a normal blue/red value deck. But Izzet's common creatures are small and ground-bound; there's ONE blue two-power flier in this set, and it's a multicolored rare. Instead, there are a ton of cheeseball damage forcing cards, many of which have Jump-Start. This version of Izzet is like ordering delivery mozzarella sticks to a party, not sharing them, then double-dipping them in the communal salsa bowl. The key is to make sure you get in enough chip damage that your janky burn spells can actually meme them out. Passwall Adept and Fresh-Faced Recruit are a key commons, and hard-to-interact with incremental damage outputs like Electrostatic Field are crucial. Cosmotronic Wave is legitimately good, forcing through a ton of damage while often breaking even on cards. White can be a great splash in this deck, with Garrison Sergeant and Hammer Dropper doing fantastic work with your Maximize Altitude / Sonic Assault Jump-Starters. Your deck will be awesome, provided you don't expect it to, you know, work. I instantly forgot about Multani, flooded out, and got pancaked by a couple of Coldwater Snappers. Now, I'm no pro. But early in the format, everybody is making mistakes like this one. It's particularly hard to remember cards that aren't on the battlefield or in your hand. So if you have Jump-Start cards in your deck, you need to be thinking about how keeping lands in hand so you can double up. You need to not be shy about asking your opponent the contents of their graveyard – relevant for Undergrowth, too. Hybrid mana also presents a logistical challenge. LSV himself once went through a whole cube draft without realizing he had a great hybrid card in his sideboard! It's an easy mistake to make, but you want to be playing Whisper Agent in well over half your decks. Things are even trickier with the split cards. They really look gold, and a lot of them feel sort of off-color, but Connive//Concoct and Discovery//Dispersal should always be in your Golgari decks. Personally, I'll be sorting my hybrid cards with my artifacts. Dimir and Golgari are essentially interchangeable at the top, since I expect the two will be played together very often. Golgari gets the edge because of the quality fixing, and because WBG is more consistent than UBR, as you're more likely to get a white bomb you can splash with your Selesnya Guildgates than a red bomb for your Izzet Guildgates. Selesnya and Boros are also both quite powerful, but suffer slightly because of the more unreliable base strategies; you need to draw the right mix of tiny creatures and payoffs, and both decks can be unwound by a well-timed removal spell. Aggressive strategies tend to be weaker in Sealed, and this is no exception. Both guilds have great rares, which is a big plus. But Izzet's first in my heart. Looking for more MTG content?